Here's a super idea for the man in your life who enjoys fishing! Mystery Tackle Box! Imagine his enjoyment at receiving a mystery box filled with fishing goodies! 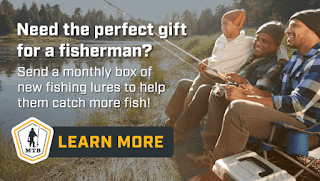 And here's the good news - My Readers Get $10.00 Off Your First Mystery Tackle Box - New Subscribers can enjoy $10.00 off their first box of Mystery Tackle Box fishing tackle subscription by using the promo code USFAM10. Get a box full of new fishing products delivered straight to your door. Subscriptions start at $15 per month. Coupon valid through December 31st, 2017. Visit http://mtbfish.com/holidaygiftUSFAM to learn more! Be sure to check them out!! This would of course make a great Holiday gift!